Victory of mind over body. My ultimate suffer fest. Never before have I voluntarily subjected myself to this much pain and suffering. 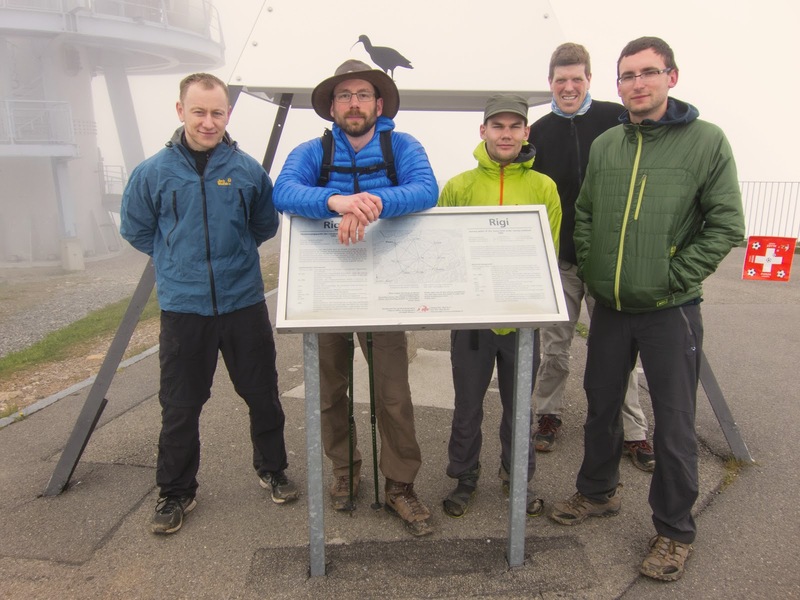 For this year's annual Rigi Marsch, a 50km, +1500m hike through the night from the village of Bremgarten up the mountain Rigi, Andrey, Pawel, Jochen, Ben, Helmut, Ronny and me start at 20:00. 14 hours later, at 10:00 o'clock in the morning 5 of us take the last special train down from the summit, completely wasted but happy. Both my surgeon and my physical therapist advised against me even trying, saying it wouldn't be possible at the current stage of my recovery. From prior experience I know I have a range of about 30km before the pain becomes really bad. By using walking poles I extend this to 35km. Still, at about four in the morning I'm nearly dead, stumbling forward by sheer force of will, running on fumes. I'm a red hot ball of pain. Doggedly focused on the next step and the next. Total tunnel vision. Every fiber of my body is screaming, begging me to stop. It would be so easy. Just sit down, allow sleep to finally overwhelm you. Just say the word and let others handle this lump of meat, shuttle it back to safety. Instead I go on. Occasionally a tiny whimper escapes my throat. When we do rest, the others shoot me worried glances, thinking I might not be able to get up again. Two days earlier I caught a cold, causing me to loose a lot of sleep because of my clogged nose. I am beyond tired. Now when I blow my nose I end up with more blood than snot in the tissue. I have a painfully inflated belly and explosive diarrhea. At some point when I escape behind a tree for relief I only poop translucent slime. There is simply nothing left. I thought it would be a good idea to take Anita's backpack instead of mine because it is slightly smaller and lighter. Stupid mistake. It's cut for a woman and adds painful pressure to my stomach. At the first checkpoint spirits are high, hundreds of people are standing around chatting, queuing for hot tea and soup. At the second checkpoint the mood is noticeably more subdued and quieter. People start sitting down and catching some rest. Checkpoint three sees folks laying down on the ground and stretching their legs, maybe even catching a nap. Checkpoint four is a field hospital in a war zone. Nobody talks, except for the occasional volunteer manning the station, making the rounds and checking up on sleeping people. Everybody is sitting or lying on the ground, you navigate around bodies as if on a battle field. People get "evacuated" in big buses. Checkpoint five, the pen-ultimate one, half way up the mountain, is much more cheery again. If you've made it this far, you'll likely get up all the way. Also, the sun is up at this point. We loose Jochen just before checkpoint four. While we stayed together as a single group most of the way, he starts falling back. Out of sight from us he literally collapses. Luckily for him not far away from the bus back. We only learn about his misfortune when he sends us an SMS. Half way up the mountain at checkpoint five Ben gets shaken by a severe bout of Asthma. He's coughing up chunks of phlegm and sounds about to keel over and die. He wisely decides to play it save and return by shuttle. All the while Andrey is casually strolling along, not even wearing proper shoes but light open trekking sandals. He takes the cake on the train back when he reveals that he had been carrying a six pack of half liter beer cans all the way. None of us is fit enough to have any though, so we simply bring it back home. I used to be able to keep up with him. Getting back there must be the goal. I reach the summit ridge first and lay down on a bench, waiting for the others. We are in contact by phone so they know where I am. Unfortunately due to a miscommunication they pass me by without seeing me. I sleep for twenty minutes and get woken by their phone call from the summit, asking where I was? By now it's quite late and the last cog wheel train down leaves in 40 minutes, leaving me very little time to catch up with them. I have reached a very weird state. Somehow I have transcended pain and turned into some mindless biological walking machine. I have no idea where this is coming from, but I'm almost running up the mountain now. Occasionally random emotions will bubble up in my mind from nowhere, making me well up unexpectedly and drive tears to my eyes. I reach the summit just in time. Utterly destroyed but happy. We take the obligatory summit pics in the fog and hurry back down to the train. It's over.